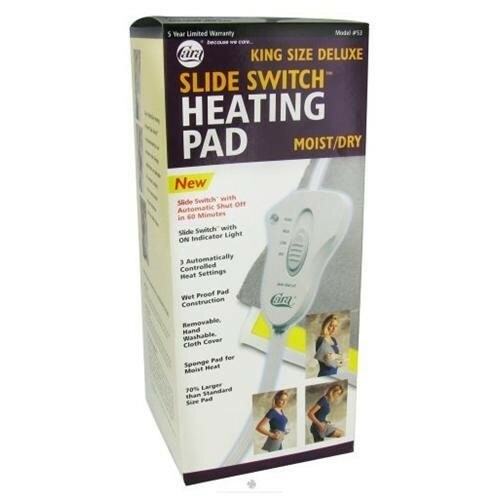 Cara Slide Switch Moist Heating Pad to soothe your achy joints today! The Cara Slide Switch Heating Pad is the first heating pad to offer a new design change in over 50 years incorporating two unique “Auto On/Off” timing controls to improve moist heat therapy sessions. Studies show that more effective moist heat therapy sessions take between 20-30 minutes. The Slide Switch is programmed to automatically provide these 20 minute sessions for you. Once a 20-30 minute therapy session is completed, it is important to let your muscles cool for 20-60 minutes to allow the body to return to normal temperature and then repeat the therapy again. The Cara Slide Switch heating pad is designed to automatically provide those timed interval sessions for you. The Slide Switch Remote Control is ergonomically designed with three color coded buttons that have a unique surface “feel” allowing for easy heat temperature selection for the visually impaired. The remote also features indicator lights that notify the user when the pad is on and which interval is currently programmed. Find out why more and more healthcare professionals and people with arthritis are recommending the Cara Slide Switch Heating pad for arthritis, back pain, and or muscles spasm. Call Toll Free 1.866.422.4866 today to order your heating pad. Heating Pads are NOT covered by Medicare or Insurance. Using a moist heating pad helps muscles relax and increases circulation. Moist heat pad therapy is a process that helps alleviate pain and improves muscle elasticity. Slide switch auto timer controls selected heat sessions at 20 or 60 minute intervals. Simple to use large color coded buttons and indicator lights. Wet-proof pad construction allowing moist or dry usage. 70% larger than standard size pads. UL approved for higher safety standards. Advanced Diabetes Supply also offers a wide variety of Diabetes Testing Supplies, Respiratory Supplies and Impotence Devices, most of which are covered by Medicare and most private insurances. Call us at 1.866.422.4866 and we will handle it from there.